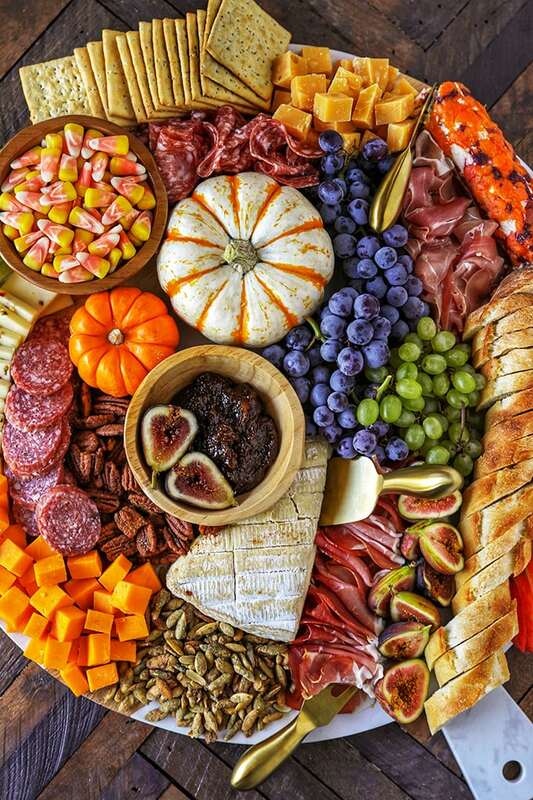 This easy to make Charcuterie Board is perfect for parties, and can be served as a fun dinner or as an easy fall appetizer for a bigger party. Colorful and packed with delicious meats, cheeses and fresh fruit, I included all my best tips for how to make a charcuterie board! Charcuterie boards are such a show stopper, and I have been obsessed with them for a while now. I even follow the #charcuterieboard hashtag on Instagram. 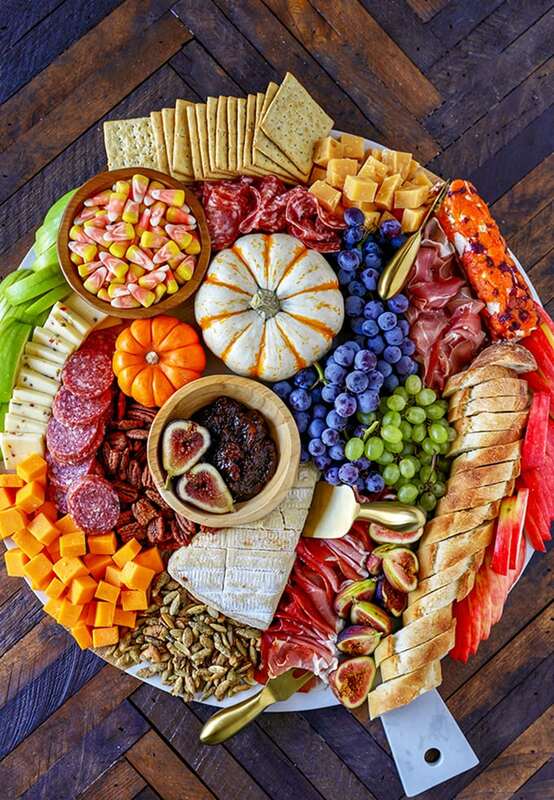 I just love looking at all the colors and arrangements, plus cheese and crackers has always been my favorite meal! I linked the supplies I used for this charcuterie board at the end of the post. 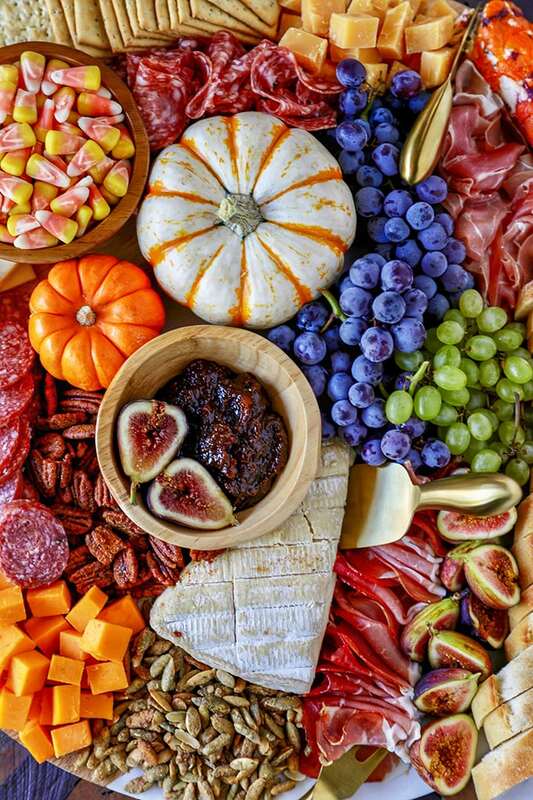 Keep scrolling to see a fun Halloween Charcuterie Board variation. To keep this charcuterie board budget friendly, I did almost all the shopping at Trader Joe’s. I love the variety of meats and cheeses that they carry as well as the variety of fruit. I also included my new favorite find, these naturally flavored candy corn from Brach’s. I picked up a bag at Target because I liked the more muted colors than traditional candy corn and discovered that they are so good! These are must-try! They taste just like fresh buttercream! Give yourself plenty of time to prepare so you don’t feel rushed. I really took my time arranging this and it took about an hour. I think the average time to assemble, including slicing, washing and drying fruit and arranging, would be about 45 minutes. Replenish the crackers and bread as needed. Slice the bread last and serve the slices close together to keep the bread soft. Slice a second loaf and keep it in a plastic baggie so it doesn’t dry out. Keep a color theme in mind when planning your board. 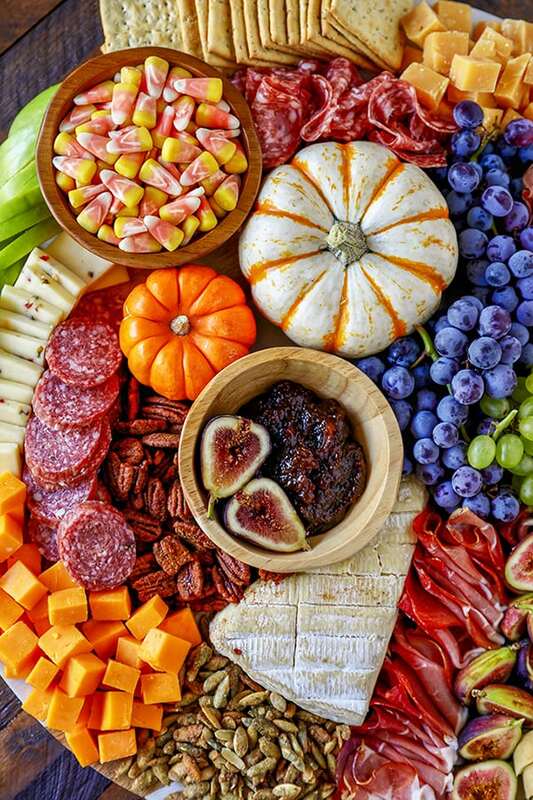 I went for oranges and purples with a touch of green in this charcuterie board. Place complimentary flavors close together. For example; brie, figs, prosciutto and french bread are all close together, then hard cheese, soft salami and crackers are placed close together. Start arranging by placing large items like pumpkins and bowls slightly off center. Then place whole cheeses and grape bunches. Fill with meats, cut cheese and nuts. 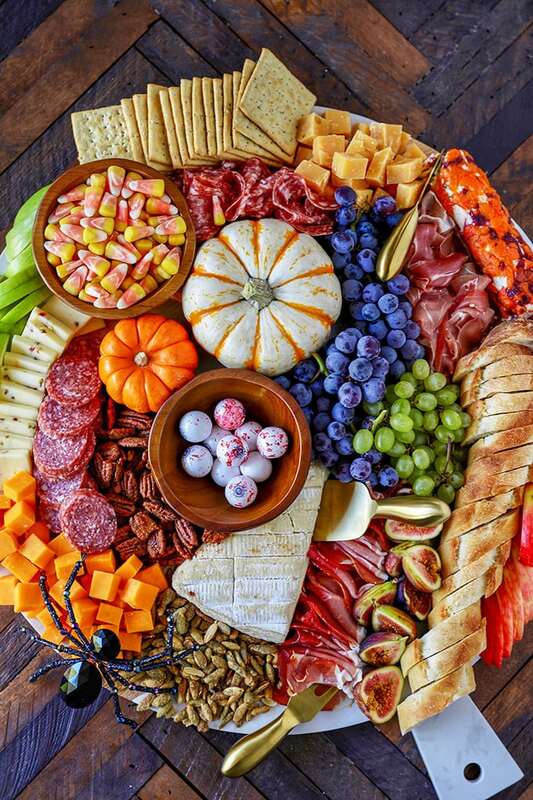 This charcuterie board will feed about 6 adults as a meal, or 12 as an appetizer. Assemble on a 20 inch round platter. If assembling ahead of time, brush apples lightly with lemon juice to avoid browning. 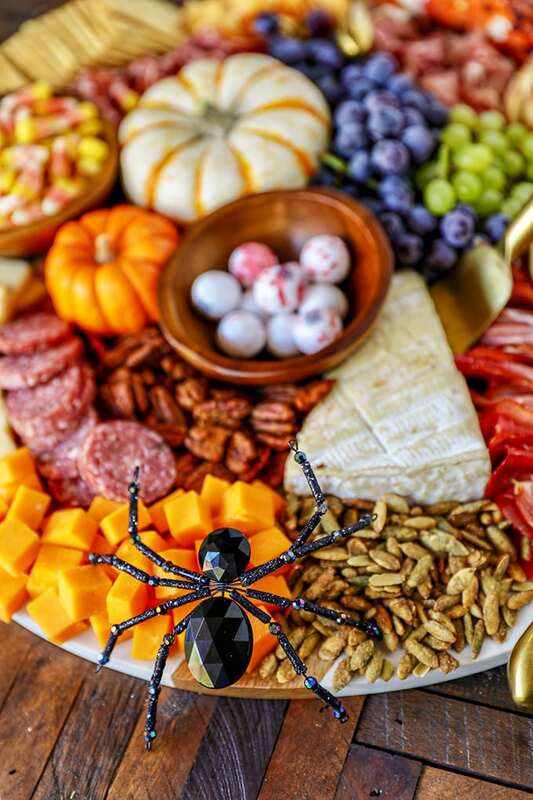 I had fun with the Harvest Charcuterie Board and switched it up for and created a Halloween Charcuterie board by adding eyeball candy and a fancy spider. I found the eye ball candy at Home Goods and the jewel spider at World Market.